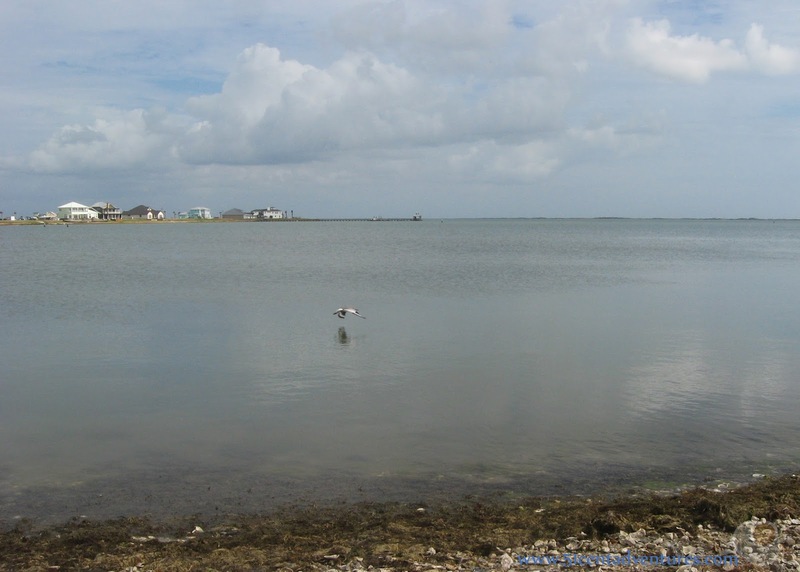 Description: Unlike the most of the other beaches in Texas, the beaches around Rockport, Texas have rocky shores. Goose Island State Park is situated on one of these rocky shores. It doesn't have a swimming beach, but instead has a very long fishing pier. Away from the shore there are many coastal live oak trees that provide ample shade. 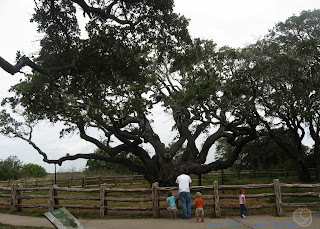 The most famous live oak, The Big Tree, grows about a mile from the main part of the state park. The Big Tree has been growing for over 1000 years. Location: 202 Palmetto Street, Rockport, Texas. The park is actually located 10 miles north of the town of Rockport, Texas. 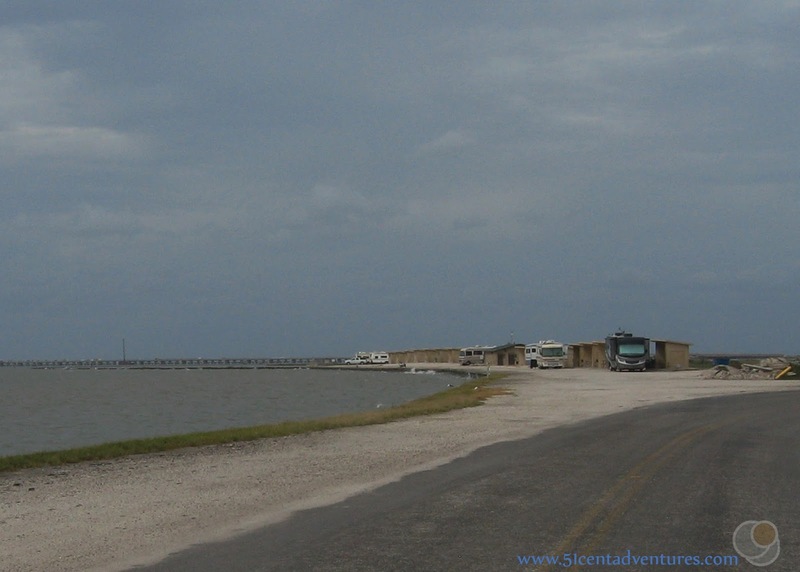 You have to cross over the channel between Copano Bay and Aransas Bay to reach the peninsula of land where the forested part of the park is located. Goose Island itself is just off the shore of the mainland in Aransas Bay. Cost: $5 for adults. Children under 12 are free. Camp sites costs $10 for a walk in tent only site, $18 for a wooded campsite with water and electricity, and $22 for a bay side campsite with water and electricity. Operating Seasons and Hours: The park is open daily. The gates are open from 8:00 am to 10:00 pm the office is open from 8:00 am to 5:00 pm. 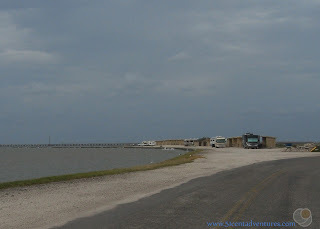 This was the fifth and last stop on the third day of the Texas Coastline Road Trip that my husband and I took our kids on in November of 2014. 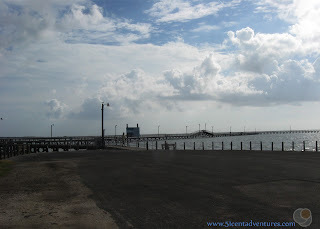 We drove away from the Port Aransas Ferry, and headed toward Rockport Texas. 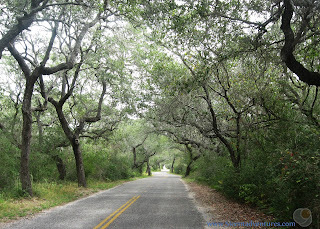 Then we drove 10 more miles to reach Goose Island State Park. As I planned this road trip I noticed that a lot of our potential destinations all started sounding the same. I kept reading about great beaches with lots of activities around them. 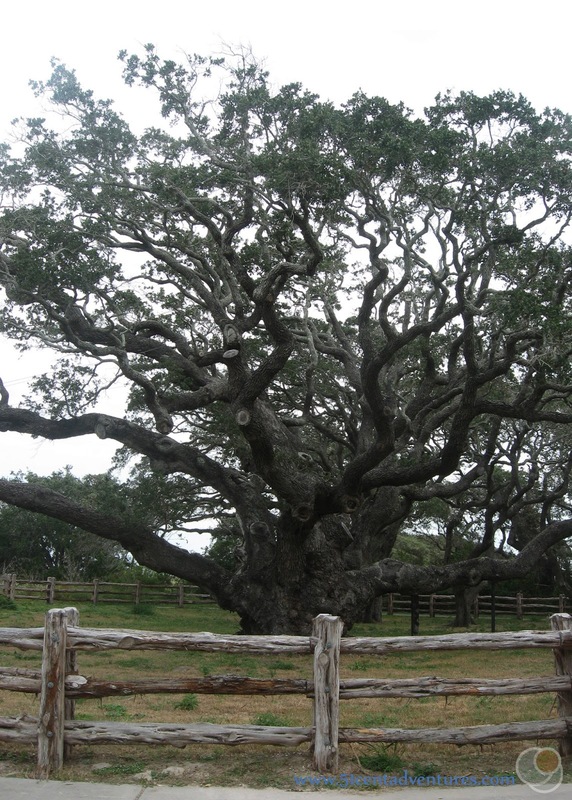 The description for Goose Island stood out to me because it mentioned that the park was the home to The Big Tree, a coastal live oak that had been growing for over 1000 years. That tree sounded exactly like something I would like to see. As I researched some more I discovered that Goose Island State Park was the home of many coastal live oaks. And that these trees provided shade at the camp ground. Shade was really important to me because I knew that our enchanted beach vacation could very easily turn into "that week we all got sunburns and heat stroke." I decided that we should plan to camp in the wooded area of the park. We arrived at the park a little before sunset. I'd already reserved a campsite online, but I didn't know if we had an assigned spot or not. The office closed at 5:00 so we didn't know where we should camp. My husband found the camp ground hosts and they just told him to pick any spot and sort it out with the office in the morning. So we picked a large spot near the restrooms and started setting up our camp. After the tent was up we had dinner. It was dark so the trees weren't giving us any shade, but they were helping out in another way. They kept the wind away from us. We'd been camping on the edge of a marina the last two nights where there had been an almost constant breeze. In contrast, the air at this campsite was still. We greatly enjoyed eating out meal without worrying about our paper plate blowing away. The kids played around in the dark for quite a while. 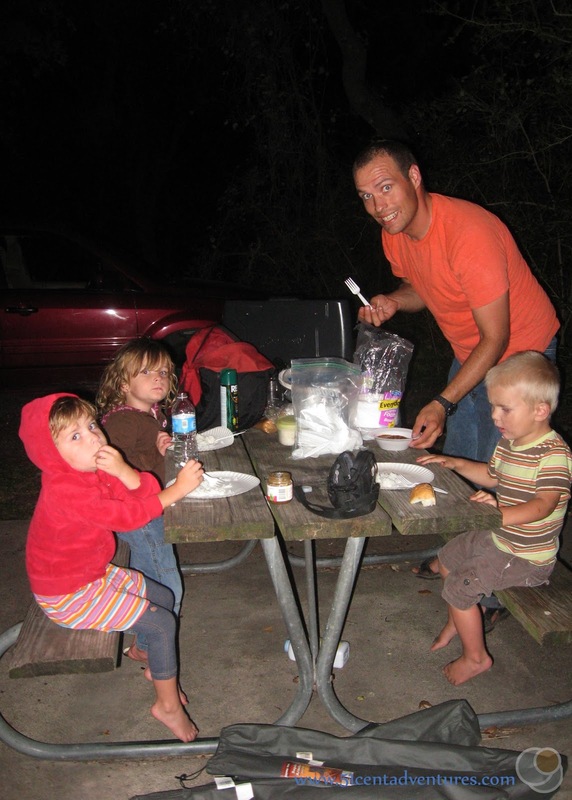 They were happy that there weren't any pokies on the ground at this campsite. Then we brought them into the tent and put them to bed. As soon as they were asleep I headed over to the bathroom to take a shower. I'd wanted to take a shower the night before, but the RV Park showers required quarters. I didn't have any and so I'd had to wait a whole extra day to get clean. This shower was included in the price of the campsite, and I used as much water as I could. That shower was heavenly. Being clean again was wonderful. We all had a great night sleep, and woke up to a beautiful morning. I think my favorite thing about that campsite was how private it was. There were trees on three sides of us. There was only one other couple on our camping loop, and they were about 10 campsites away. I liked that we could do whatever we wanted without everyone noticing. The campground itself was beautiful. There were large live oak trees all over the place. When I first moved to Texas I kept noticing lots of references to live oaks. Mostly I kept seeing neighborhoods with "Live Oak Street." It took me about a year before I found out that a live oak is an evergreen oak tree. It doesn't go dormant and lose it's leaves in the fall. It's leaves fall off in the spring after new ones have grown. Live Oaks are one of the reasons that the South always looks so green. 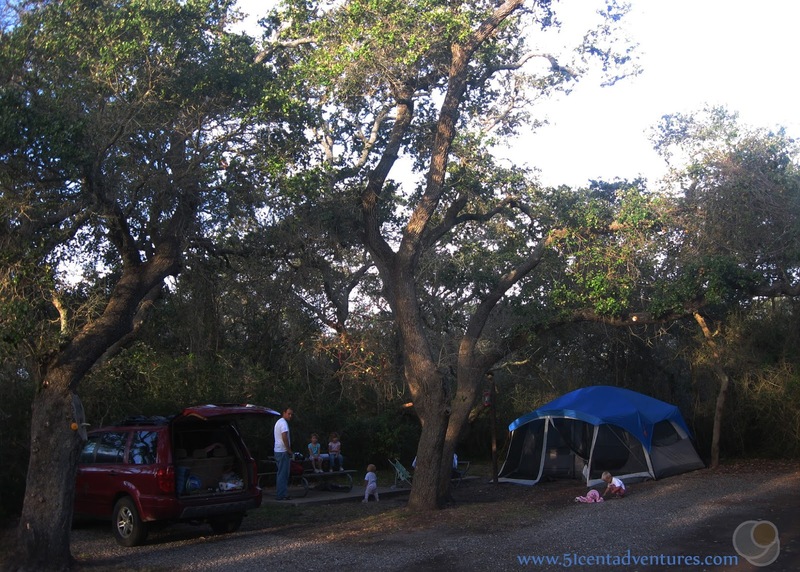 The leaves on the live oaks around our campsite made it seem like we were camping in the summer instead of November. We weren't in a big hurry so the kids played around at the campsite while my husband and I leisurely packed everything up. 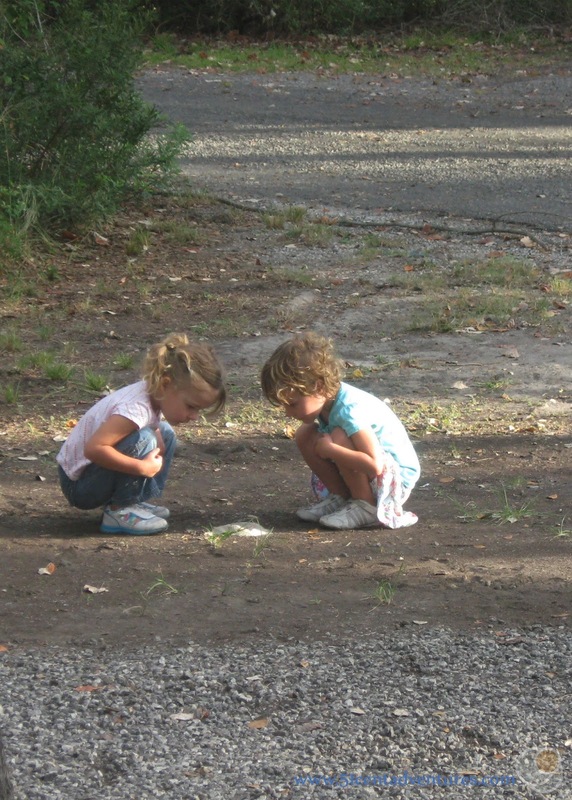 As usual our kids had tons of fun with rocks. My girls found a fire ants nest and watched it carefully. After everything was packed up we drove the short distance to the shore. We had to cross a tiny bit of water and then we were on the actual Goose Island. So far every beach we'd visited had been different. This one didn't have a sandy area at all. 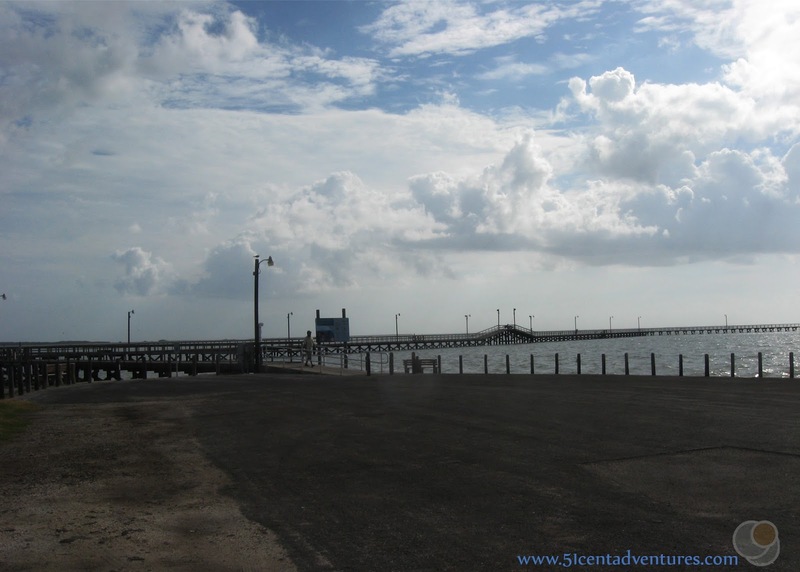 Instead it had a 1,620-foot long fishing pier that stretched out over the water. We parked in the parking lot by the pier, and got ready to walk on it. I was nervous about taking the kids on that pier, but I knew it would be neat to let them stand on it. So we carefully walked out to the end. 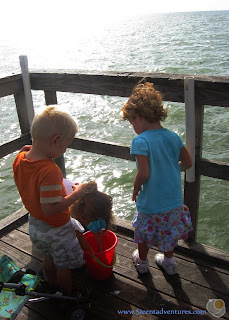 We brought a bucket of rocks and broken shells along so that my son and the other kids could throw them in the water. Most people fish from the pier. 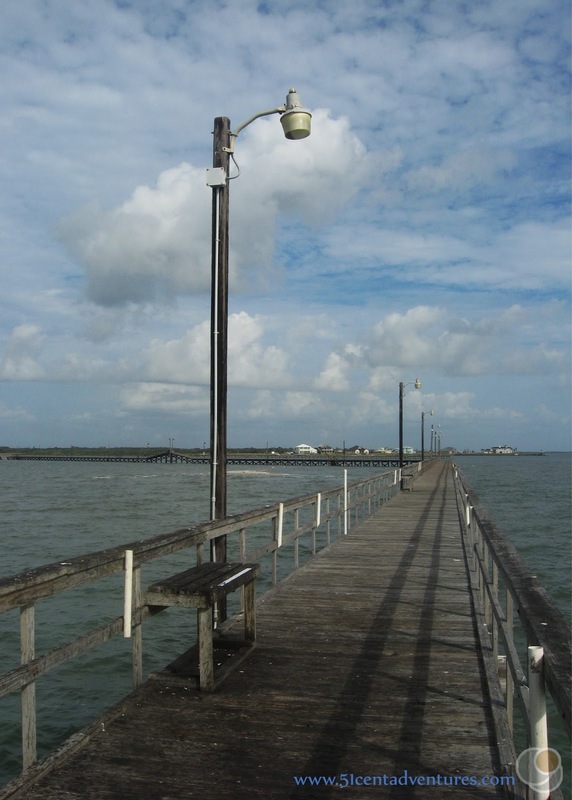 You don't have to have a fishing licence to fish from the shore or pier at a Texas State Park. I didn't know that at the time or else we might have tried fishing for a little while. We even could have rented fishing gear from the park office. The water was very pretty. We were able to see a dolphin swimming in the water. I though that this water was part of the Gulf of Mexico. Later I learned that it was part of the Laguna Madre which spans most of the coast of Texas. San Jose Island was just out of sight over the horison. 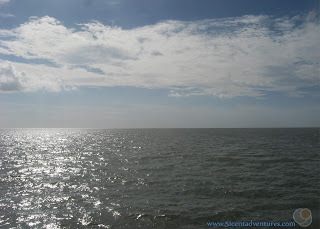 The Gulf of Mexico was beyond the barrier island. We only stayed on the pier for a little while before we walked back to the safety of land. We stayed on the shore for a long time to let my son throw rocks into the water. (It's his favorite passtime.) We even had a little picnic while he did that. Then we got back in the car to go see The Big Tree. On our way off of the island I took a picture of the shore side camp ground. I was glad that we'd decided to stay in the wooded campground. From reading about the park in my Texas guidebook I'd been under the impression that The Big Tree was right by the shore. However, it really is about a mile away from the rest of the park. In fact, you technically wouldn't need to pay the park fee if you wanted to visit the Big Tree. We drove out of the park on Palmetto street and then turned right onto 12th street. There were signs that helped direct us which way to go. We the road was narrow and lined with trees. We passed many driveways that led to homes. I was very impressed when we arrived at the Big Tree. There were live oaks all around, but it was quite obvious which tree was "The Big Tree." It's branches spread to a diameter of 89 feet. The tree was only 44 feet tall so it is wider than it is tall. There were several support structures set up to help hold up some particularly long branches. The most impressive thing was how old the tree was. This tree has been growing for over 1000 years. One Thousand Years! The tree was so large that I had trouble getting a picture of the whole thing. My girls were very impressed by it's age. They named it "The Thousand Year Old Tree." They said it looked like a spider on it's back. They also told me that it was probably very scary at night. They told me to never bring them here at night because they would be scared. We walked all the way around the Live Oak and admired it's sprawling branches. There were other trees around the big tree. They were all growing sideways because of the strong winds that blow in from the ocean. This area was only about 100 yards from the shore. After admiring the trees we got back into the car and started driving to our next destination. We didn't have mach sightseeing planned for the day, but we did have to travel over 150 miles. We were heading to Brazos Bend State Park which is about 30 miles south of Houston. We planned on stopping for lunch at a McDonalds along the way. We also needed to go shopping for some more fresh food. So it was time to get going. Goose Island State Park was everything I hoped it would be. The campsite was shady and private. The pier was interesting and gave us a great view of the water. And the Big Tree was a unique natural wonder. I was very satisfied with out visit. Recommendation: If you are looking for a good swimming beach then Goose Island State Park isn't the place to visit. However, if you want to visit the shore, but still have shade then Goose Island State Park is the perfect place. 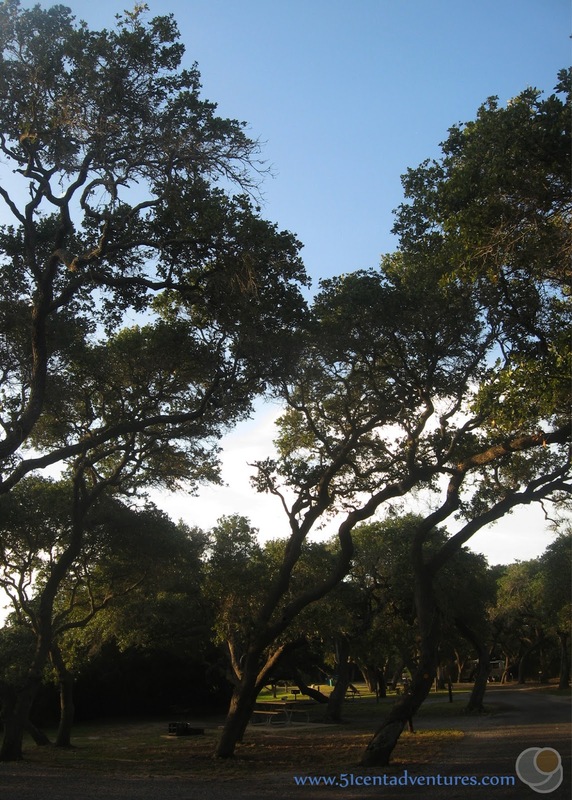 Hundreds of Coastal Live Oaks provide shade in the camp ground. The Big Tree is an unique feature that is worth a visit as well. 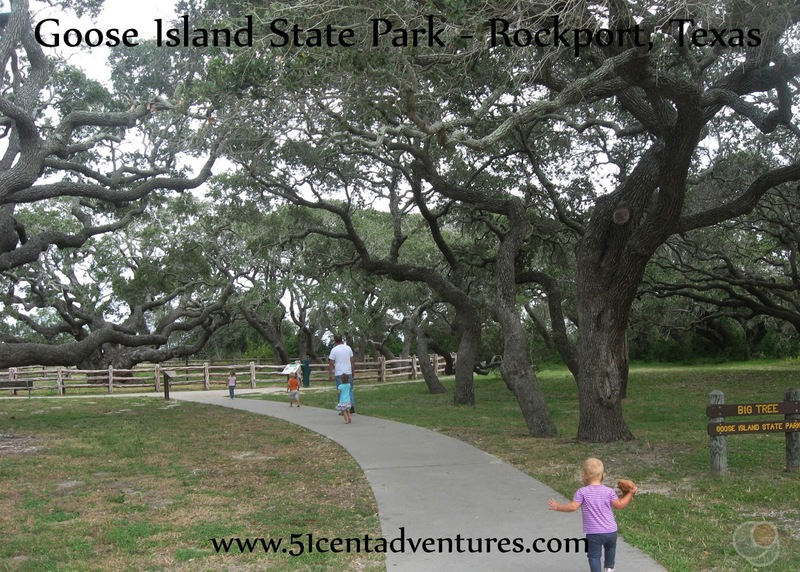 Directions: The park is located 10 miles northeast of Rockport. 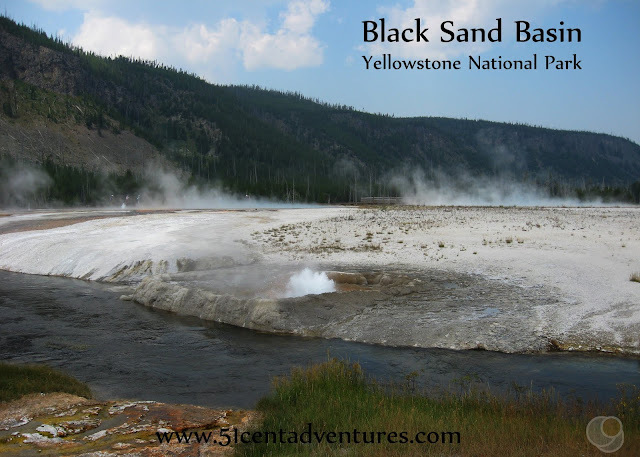 Take State Highway 35 to Park Road 13, and then travel two miles east to the park entrance. Places Nearby: The Texas Maritime Museum is located in Rockport, Texas. We passed this museum on our way to Goose Island. I would have liked to stop there, but it closed at 4:00 (and it wasn't open on Mondays anyway). Part of me wanted to backtrack to the museum after we left The Big Tree on Tuesday, but my kids were getting ready for naps so it wouldn't work out.